Millions of fans around the globe punctuate properly and communicate clearly thanks to Mignon Fogarty's practical and easy-to-remember advice about writing style and word usage. Her first book, Grammar Girl's Quick and Dirty Tips for Better Writing, hit the New York Times bestseller list, and her weekly grammar podcast has been downloaded more than 20 million times and hailed by USA Today as "authoritative but warm." Now, in tip-of-the-day form, Grammar Girl serves up 365 lessons on language that are sure to inspire. 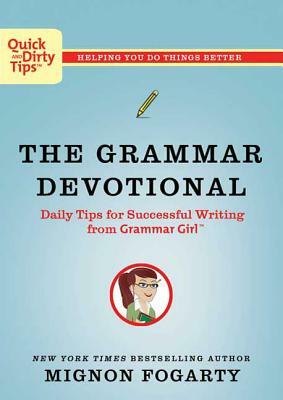 Filled with new, bite-size writing tips, fun quizzes and puzzles, and efficient memory tricks, The Grammar Devotional gives you a daily dose of knowledge to improve your writing and also serves as a lasting reference you'll use for years to come. Mignon Fogarty, the creator of Grammar Girl and the founder of the Quick and Dirty Tips network, is also the author of The New York Times bestselling GRAMMAR GIRL'S QUICK AND DIRTY TIPS FOR BETTER WRITING and THE GRAMMAR DEVOTIONAL. Her straightforward, bite-sized tips on grammar have led to features in the New York Times, USA Today, the Los Angeles Times, and an appearance on Oprah. She lives in Reno, Nevada.